As I sat on my friend’s living room floor watching the Oscars, I was amazed by the hype surrounding the awards ceremony. My reactions probably seemed naive, which is rather unsurprising since it was my first time ever watching the Oscars. In fact, I’ve never seen the Tonys, the Grammys, the CMA’s or any of the other nationally acclaimed awards ceremonies. So it was all new. Many of my favorite actors, all “glitzed and glammed,” were present and interviewed. The Oscars creates an intense concentration of talent and fame. I’d never seen anything like it. During the Red Carpet interviews, I took it all in: who was there, what they had starred in, what they were wearing. Reese Witherspoon decided to shake that perception up with a pretty bold move. Typically, Oscars interviews move pretty predictably on a pretty narrow range of topics. Dress. Nominations. Reaction to awards. Hopes for the new year. Tired of being asked about what she was wearing, who designed it and why she went for a striking black and white gown with a classic cut, Witherspoon decided it was time to call attention to a deeper side of those present at the Oscars, using social media to encourage fans and media to #askhermore. Yes, these actresses should expect to answer questions about their wardrobe. Obviously, their extravagant and uniquely designed dresses make big statements. But we must never forget that there is a person inside the gown. How often were we told as children that we must not judge based on appearances, but rather we should get to know who a person is on the inside? That line is easy enough to remember when we don’t like what’s on the outside. When there just has to be some redeeming factor on the inside to make up for the outside. Yet all too often we forget all about looking deeper when we like what we see on the surface, be it an extravagant dress or someone who seems to have it all together. Beauty exists beyond our ability to perceive it. This is especially true when it comes to people. This applies to the way we categorize people. the term 'person' has been coined to signify that a man cannot be wholly contained within the concept 'individual member of the species', that there is something more to him, a particular richness and perfection in the manner of his being, which can only be brought out by the use of the word 'person' (2). We ignore a fundamental part of the human person when we limit ourselves to these general classifications. We ignore the greater depth of the individual: their passions, hopes, virtues, joys, and sorrows. I don’t mean to say that we need to know the personal lives of every celebrity. Actually, I am a fan of the celebrities who choose not to broadcast every juicy details of their personal lives to the media. But we should not forget the individual qualities and passions of a person because of their fame, wardrobe, who they know, or what they do to make a living. it’s a day for jeans and a t-shirt or a night for a dress made of six thousand pearls. We are more than what we do, whether we star in movies, run companies, teach kindergarten, or pick up garbage. Look beyond the surface of what you see. While we may never know the depths of someone’s personhood - which to a large extent is meant to remain private - we cannot remain at the other end of the spectrum where we forget that this deeper side exists. 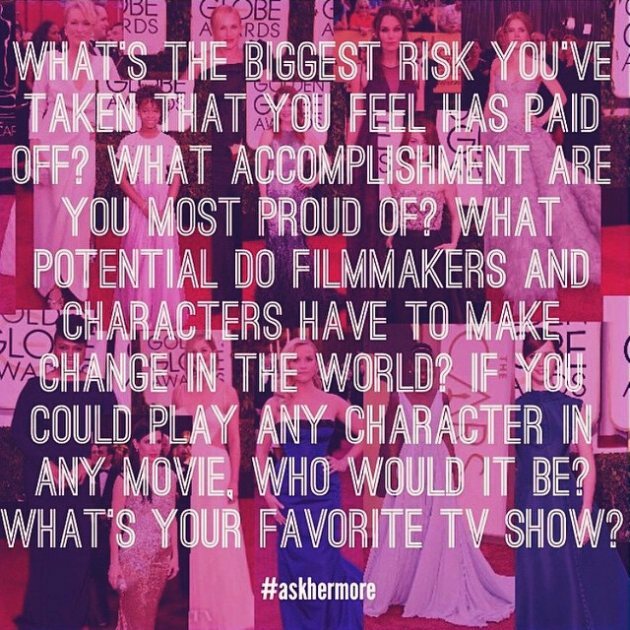 We must not forget to #askhermore. Some of my favorite things to do are dance, travel and coordinate events, as well as study mathematics and computer science. 1. Karol Wojtyla. Love and Responsibility, 22. 2. Karol Wojtyla. Love and Responsibility, 22.